The heart of Seacording installation is a tub which is placed near a sauna or swimming place etc. The tub it is open for all visitors. When the visitor goes to the tub and dive, s-/he hears a sound work from the underwater speakers. No sound is heard outside of the tub. The work was commissioned by Finnish Institute, Stockholm, for Tempo documentary festival in 2017. It was also installed at the Art Fair Suomi 2017 festival in Kaapelitehdas. A sound work based on underwater recordings at Baltic Sea. Created in collaboration with SYKE, the Finnish Environmental Institute. Image: European Maritime Days conference, Turku, May 18th, 2016. An experimental computer film by Jan Bark and Erkki Kurenniemi. The original film is lost. Reconstructed in 2013 from the work tapes found from the Swedish archives by Mika Taanila (film) and Petri Kuljuntausta (music). Live performance at a sound concert organized by The Unknown City society as a part of the international Art’s Birthday event. Vapaantaiteentila / Space For Free Arts. Recorded live at NightinGala, June 12, 2008, Järvenpää. Whistles, Trills & Clicks was commissioned by NightinGala festival which was held in June 2008 at Järvenpää, Finland. The festival gathered first time together the world’s leading nightingale specialists, who attended to Finland to offer the latest scientific findings on the singing style and acoustic communication of the nightingales. Along with the scientific conference was arranged a concert series. All commissioned composers, performers and artists were invited to create a new work based on nightingale singing. Petri Kuljuntausta and Sami van Ingen created a duo live performance entitled ‘Whistles, Trills and Clicks’. The sound material used in the work contains nightingale singing (processed and real), white noise and feedback sound which was controlled live. Real time image manipulation (monitor to camera feedback) of found footage images. Five-channel installation production of the video work. In recent years, human rights organizations have repeatedly criticized the Nordic countries, Finland in particular, for their unwieldy response to violence against women. Research shows that the majority of sexual and other kinds of violence against women takes place in intimate relationships, within the private sphere. Five fragments of the extinct empathy is a short documentary about the lack of empathy for and violence against women in Finland. In collaboration with: The Promotion Centre for Audiovisual Culture AVEK/ Media art (Heidi Tikka), Finnish Culture Foundation, Arts Council of Finland, Finnish Academy of Fine Arts, Amnesty International and UN Women. Planetarium Concerts at Tampere Planetarium. Two nights in April-2002. Tampere Biennale festival. 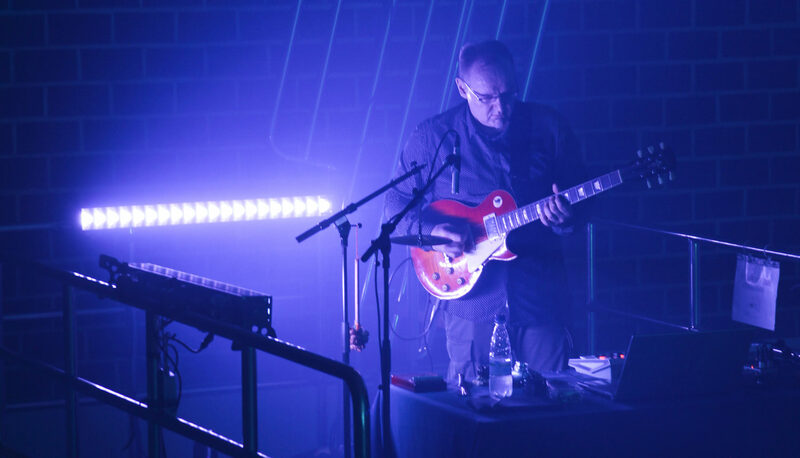 The concerts at Tampere Planetarium were based on electronic works under the theme of Space. One of the premiered works was Aurora Borealis 1, which Petri Kuljuntausta had composed from the acoustic sounds of Aurora Borealis. w/ Juhani Liimatainen, Unto K. Laine. “Nautilo” installation was exhibited at at the Oulu Museum of Art. Part of the Checkpoint Leonardo exhibition, Nautilo is shaped like a diving helmet and was constructed from ice and snow. The work includes a soundscape designed by sound artist Petri Kuljuntausta, and a visual world embedded into ice, designed by visual artist Kristiina Ljokkoi. The mounting of the installation and the artists’ visions are documented on this YouTube video. Petri Kuljuntausta curated online sound exhibition for Kiasma Contemporary Art Museum in 1999. The online exhibition contained 40 works from international artist and composers. From the SOM map the user can select the artists and composers, or listen to the works according to their sound elements. Petri Kuljuntausta’s Charm of Sound (1997) is a text-based environmental composition in three parts, which is composed for outer space environment. In 1997 Cassini-Huygens spacecraft (Titan-IVB/Centaur) was launched from Kennedy Space Center, United States, and reached its destination, Saturn’s moon Titan, on Friday January 14, 2005. Inside the Huygens probe, stored on the CD-rom, was Kuljuntausta’s Charm Of Sound, which landed on the ground of Titan after travelling over seven years and four billion kilometres through Space. Petri Kuljuntausta has stated: “If we suppose that there is somebody in outer space who could find the Huygens probe and understand how the CD-rom works, signs of English language and meaning of artwork, then the composition is possible to realise with very basic elements, liquid and solid materials (objects), which might be available on Titan’s ground”. Live at Film Winter festival, Stuttgart. London’s Open Weekend, this dance event of break neck speed and excitement, cannot be better placed than in Stratford – the heart of the developing Olympic City, 60×60 Dance is fitting to celebrate the official two year countdown towards the Olympic and Paralympic Games 2012. On the CD Wings the track entitled ‘Improvisation with Bali Starlings, Red-whiskered Bulbuls, Common Quails, and House Sparrows’ was recorded in this concert. The work contains real underwater singing by burbot fish. 30sec long burbot sound recording that I divided to parts. Every time when the recording started, it started from the beginning and was slightly longer than the previous one. Finally was heard the full-lenght 30sec recording. It was heard once in every 3 minutes. This sound was heard through a subwoofer. In the ceiling was connected so called sound shower speaker that distributed directive sound to very narrow are of the room. People heard the sound only if they were exactly under the speaker. The underwater soundscapes that I played through this speaker were recorded at Baltic Sea. I got the raw sound recordings from Finnish Environmental Institute Syke. The organization is doing a research on the condition of the sea and they have many underwater recording spots around the Baltic Sea. 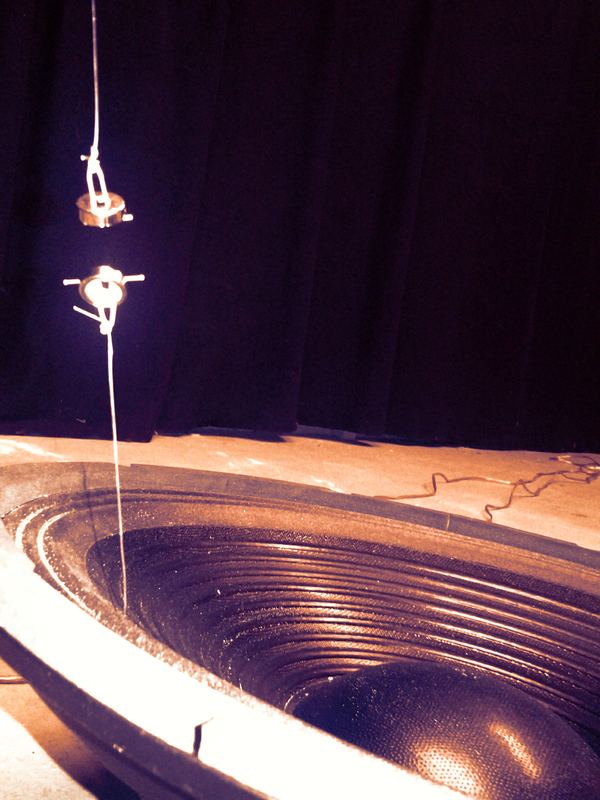 Computer-controlled hydrophones capture the sounds regularly, through the year. I selected the sounds for my work. I have actually made several pieces and installations from these sounds, and the collaboration continues. The underwater video was played through the video monitor, that was placed in the corner of the room. Over the monitor was white net. In the space there was several white nets, hanging above the visitors. The work is based on underwater sound recordings. Sound Choir founded by Petri Kuljuntausta. The group has performed sound-based vocal works from Katri Nironen, Charlie Morrow, Tom Johnson, among others. Gallery of Fondazione Nicola Trussardi, Milan. “Sound & Light. The architectural landscape is complimented by an ambient sound and lightscape which evolves and fluctuates slowly throughout the day. The soundscape is composed by Petri Kuljuntausta and played through six channels in the gallery instead of the traditional two. The soundscape is composed using sounds from three different souces that have their oringin in different historical eras; sounds of water dripping in ancient caves, sounds of a piano and sounds from a contemporary city. “The energy of light waves reveal audible sounds”. Exhibition: Grey Cube Gallery II, Bear Cave, Helsinki Zoo. According to the myth, the usually quiet Mute Swan (Cygnus olor) sings really beautiful song just before death. The last song is called swan song. The Swan song is a metaphorical phrase for a final gesture or performance before death. In 336 Swan Songs, the song of Mute Swan is heard 336 times a day – the same number of prisoners died at the Isosaari prison camp in Helsinki during the Civil War in 1918. Today the island is occupied by Mute Swans. joista soi ajoittain joutsenen ääni. Suomen ensimmäiset kyhmyjoutsenet (Cygnus olor) tuotiin Ahvenanmaalle puistolinnuiksi. Lintuja pääsi myös vapauteen ja ensimmäinen pesintä todettiin Ahvenanmaalla vuonna 1934. Kyhmyjoutsenet asuttavat nykyään myös Helsingin edustalla olevaa Isosaarta. Saari sijaitsee Korkeasaaresta etelään. Suomen sisällissodan aikana Isosaaressa oli vankileiri. Pelätty ja vaarallisiksi luokiteltu vankileiri aloitti toimintansa 15. toukokuuta 1918 ja leiri suljettiin 15. syyskuuta 1918. Olosuhteet vankileirillä olivat ankeat. Neljän kuukauden aikana leirillä kuoli 336 vankia: 267 suomalaista ja 69 venäläistä sotilasta. Vangit teloitettiin, tai he kuolivat nälkään ja kulkutauteihin. Myytin mukaan yleensä hiljainen kyhmyjoutsen laulaa todella kauniisti juuri ennen kuolemaansa. Viimeistä laulua kutsutaan joutsenlauluksi. Vertauskuvallisesti myös eräiden ihmisten on sanottu laulaneen joutsenlaulunsa kun heidän viimeisestä työstään tuli erityisen merkittävä. 336 Joutsenlaulua -teoksessa soi joutsenlaulu 336 kertaa päivässä – saman verran kuoli vankeja kyhmyjoutsenten asuttaman Isosaaren vankileirillä vuonna 1918. Music for Google Translate’s speech synthesis robot. Heureka Art Circus / Tiedesirkus on Tour in 2009. Exihibited in November 2008 at Korjaamo Gallery. The work is based on the underwater recordins at Baltic Sea. Realized in collaboration with Finnish Environmental Institute SYKE. The score got its inspiration from Michael Ammann’s Q4 (quadrophonia), a composition for a group of electronic musicians. Music for photographer Jari Arffman’s exhibition. Finlayson Media tunnel, Tampere. Real-time video work is based on the direct video feed taken from the Tampere Hall’s security camera network. Continuously changing video views of the security video system were projected untouched to the public TV monitor network around the building and public spaces of Tampere Hall. Underwater installation based on the sounds of Beluga Whale. Live performances with zoomusicologist Dario Martinelli and dancer Laura Pesonen. Sound installation based on the sound of shrimps. “Composer, performer and sound artist Petri Kuljuntausta’s soundscape Shrimp Chorus in between the concerts in the foyer of the Kuhmo Arts Centre. The underwater installation is based on underwater sound recordings. Created in collaboration with the Finnish Environmental Institute SYKE. A Video documentation on Petri Kuljuntausta’s live concert at ISEA 2004 festival. The concert was based on the sounds of the northern lights. Video based on Sami van Ingen’s live projection at the concert. The Blow on subjektiivinen draama taitelijan isoisän talon tietämilltä. Muistot koostuvat esineistä tai tiedosta. Nämä luovat välimatkan. Etäisyyttä kutsutaan historiaksi. Teos visualisoi mytologian ja toden välistä dilemmaa, inhimillistä mystifioinnin halua, joka herää vääjäämättömän tuhon – tässä tapauksessa viidakon – seurauksena. 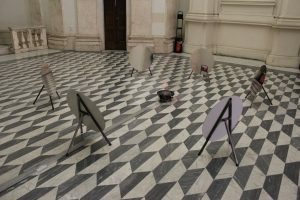 In Red Lines installation, a low frequency sound creates resonances that are transmitted to a system of laser lights and mirrors. What emerges from this is a light-painting of the sound. By refraction and multiplication, a redesigned version of the sound spread around the space of Sala Santa Rita where the viewer can concentrate to experience the connection between the sound, light and movement. I often use frequencies between 24 – 30 Hertz in my sound installations, as low frequencies create the most effective, and visible, movement in different materials, like in sand, film sheet or water. The sound frequency that I use in Red Lines is 26 Hertz. This frequency is the source for the movement and light drawings. When the speaker doesn’t produce any sound, the laser beams are still and create only tiny red dots around the space. When the sound starts, the dots starts moving and create light paintings on the architectural surfaces of the space. How the lasers are connected to speaker cone, affects to the drawings. I have tried many different ways to contact the lasers until I found the best solution. Flexible, spring-like, connection boost the vibration mechanically and then the laser drawings are more interesting. But the lasers very seldom create interesting drawings immediately when connected to the speaker cone. They need fine-tuning. If the drawing is lame and uninteresting, I change the direction and angle of the laser module. I turn it and move it, little by little, until the resonance creates a drawing that is interesting. Then I move to the next laser and tune it as well. And so on, until I have fine-tuned all the lasers that are connected to the speaker cone. Each laser light creates its own kind of painting. I can affect on the look of the drawings, but the figures are not fully under my control. The drawing process is partly accidental and to me this is interesting. My intention is to create the work and start the process, but I don’t have to control all details. I like to communicate with the technology and if the feedback is slightly different than I expected, I try to find the procedures that helps me to get the best results out from the system. When I install the Red Lines next time at a different space, the laser drawings will look totally different. The central space of Sala Santa Rita has the form of a squashed octagon, with a surface of almost 100 square meters. The physical components of the Red Lines are at the center of the space. At the center is a bass speaker and around the speaker are the 6 circular mirrors (dibond mirrors) in a formation of circle. The diameter of the installation is 600 cm. The diameter of each mirror is 60 cm. The 6 laser modules are connected on the cone of the speaker. The laser beams are headed to the mirrors, and these reflects the beams around the space of Sala Santa Rita. The distance between the drawings and the speaker and mirrors is 10 – 20 meters. The lasers draw the images above the altar, on the walls and roof. The lasers of the installation are Class 2 lasers (650 nm, 5 mW, 4.5 V). A Class 2 laser is considered to be safe because the blink reflex (glare aversion response to bright lights) will limit the exposure to no more than 0.25 seconds. It only applies to visible-light lasers (400 – 700 nm). Many laser pointers and measuring instruments are Class 2, these lasers are safe but it is not recommended to stare into beam. LIFE AQUATIC – underwater concert, sound installation and sculpture – offers experiences both under and above water from morning to evening. Life Aquatic is the title of an underwater project, which was arranged first time at Rauma Swimming Hall, August 17 – 20, 2016. Petri Kuljuntausta composed underwater installation and performed live in the evening concerts. Artist Kristiina Ljokkoi visualized the hall and created underwater sculptures. Saxophonist Jarno Tikka and architect Tuomas Toivonen composed a piece for the evening concert. For this event I’ll make an underwater installation, title of the work is Life Aquatic. The work is based on underwater sound recordings at Baltic Sea. There will be many kind if underwater sounds in the work: passing boats, fishes, sound of sea, unidentified underwater sounds, underwater electronic signals and so on. Some of the sounds has been recorded 100 metres below the surface. This work has been realized in collaboration with Finnish Environment Institute Syke. I have collaborated with Syke for several years now. They have made hydrophonic recordings for scientific use all around on the Finnish seas, and I am their “house artist”, who is creating art projects from their research material. At Syke they research the Baltic Sea and work in the field of science, I do sound works and compositions and work in the field of art/music. We both focus on the same material, but we look the material from a different angle. This is very unique opportunity to me. Especially I like this kind of collaboration as it could offer me new sound material, sounds recorded at distant locations and below the surface. As an independent artist, I could never have possibilities to make this kind of recordings by myself. The microphones were installed in the sea, they were connected to computer, that was programmed to record the environmental sounds regularly. My Life Aquatic installation is open during daytime. The audience will listen to the work underwater, they have to dive, or at least swim one ear below the water surface, to hear the sound through the scull and bones — as ear doesn’t work underwater. Over water, in the air, people don’t hear the work. All the sounds in the installation work are recorded underwater. As far as I know this is the first time ever when an art work has been realized from this basis. By this I mean that the sounds of the work are recorded in underwater environment and the listening experience happens in underwater environment. For the Life Aquatic, artist Kristiina Ljokkoi is creating underwater sculptures. These are acrylic balls which are in the swimming pools, and inside the balls are water samples, microscopic life forms, from the waters near Rauma. Ecological thinking is one of the most important factor behind the whole event. We want people to notice that our actions affects to the underwater life and its balance. If we throw plastic and other trashes to sea, birds and fishes and smaller creatures eat this and get sick. And it takes hundreds of years until the plastic is vanished from the nature. For the event I have curated evening concerts. Every evening there will be different artists and musicians performing. The audience can listen to the performances normally, no need to go to swimming pool to hear the music. But there are also my underwater speakers in the pools, so the audience could swim if they like during the performances and listen the music underwater. OR they can move up and down and compare how the music sound in the air, and underwater. We have arranged sound and light company to take care about the AV technology of the simming hall. There will be turcoise / blue based light design and smoke machine in the swimming hall. The atmosphere of the place will be totally different if compared to its ordinary use. With large molton curtains we cover the windows so the daylight can’t come in and the colors of the lights will be then better under control. Molton curtain is for acoustic use, so it damp the echoes. In 2003 I wrote a book entitled ‘Book of Silence’. There is nothing on the pages of the book. My idea is, that if I don’t give any information for the eyes and/or mind, then a concentrated reader perhaps start to hear and listen to his/her own inner sounds — ideas, thoughts…or other activity happening in the brain and body while “reading” the book. Instead of taken my ideas, I wanted to support the idea to find the reader’s own sounds. The second level behind the ‘silent book’ is, that actually the book is never quite empty (or silent), as there is always present the materiality of the pages: its presence depends on what kind of paper has been used in the book. And also, there might be some dirt here and there on the empty pages, and/or the printing process might have produced some non-intentional information for the pages of the book (ink blots, dirt…). So this level is more about the visual side & visual interpretation of the silent book.